In the near future, we plan on building two architecturally beautiful homes in the rolling hills near Joshua Tree. The land has views of downtown Joshua Tree and downtown Yucca Valley, including the San Jacinto and San Gorgonio Mountains. Both homes are being designed by Oller & Pejic, Los Angeles architects and designers of The Black Desert House. 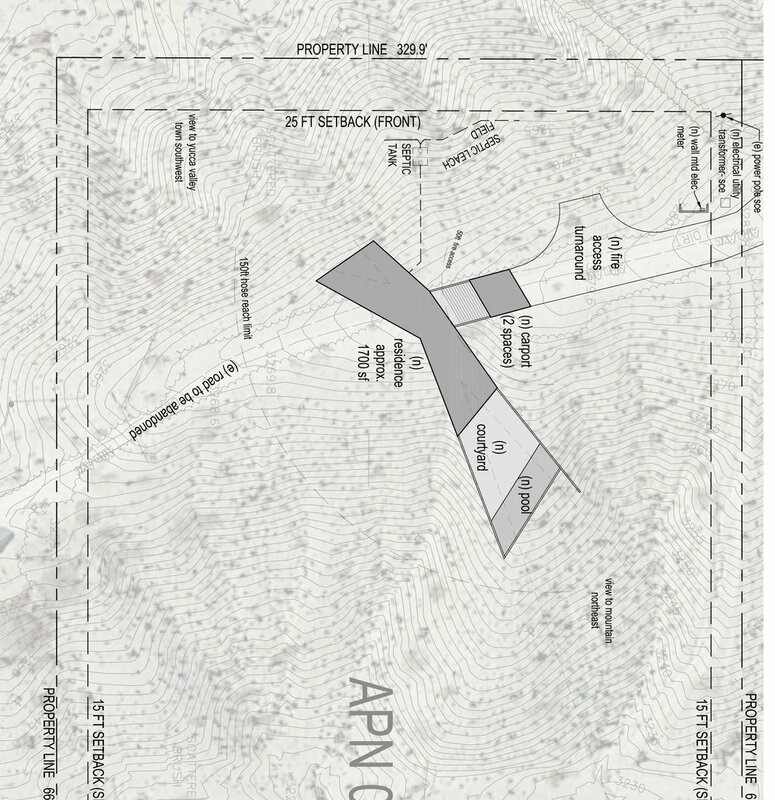 In early 2018, we bought 2 neighboring 5 acre pieces of land in an elevated area of rolling hills known as Yucca Mesa. Nestled in between Yucca Valley and the town of Joshua Tree, the 10 acres begin at the top of a ridge and stretch across a valley and up to another ridge. On the first ridge is where our main house will go, and nestled into the valley, out of sight from the main house, is where our second home will go. The Main House will be approximately 2,600 sq ft and will include 3 bedrooms, 2 baths, 2 courtyards and an infinity edge pool. Looks will be deceiving as you approach the house, unlocking a magical experience once inside. Early designs had the house appearing to hang off both sides of the ridge it's perched on. As we continued to develop the idea with our architects, Tom and Monica, it quickly became an A shape made up of 3 long intersecting rectangles. We did this to take full advantage of the best views — downtown Joshua Tree, and a nearby mountain range. Shooting out from the south side of the house is a long formal garden. The Second House will be its own private sanctuary, nestled into the valley and hidden away from view as you drive toward the house along the ridge. It's not until you start heading down the driveway that you'll be able to see it. The house will be 1,200 sq ft and may also include a pool or hot tub. And although the two homes will be a couple hundred feet from each other, you won't be able to see one house from the other. This project is on hold while we finish the main house.